Welcome to the Bluno and mobile application resource section. In this section, you will find various resources to get started developing mobile applications to interact with your Bluno projects using Evothings Studio. DFRobot is a Shanghai-based company that has launched many different products aimed for hardware engineers for just over six years - they design, produce opensource hardware especially in robotic platforms, sensors and Arduino compatible shields. Bluno (pictured right) integrates a TI CC2540 BT 4.0 chip with the Arduino UNO development board. It allows wireless programming via BLE, supports Bluetooth HID, AT commands to config BLE and you can upgrade BLE firmware easily. 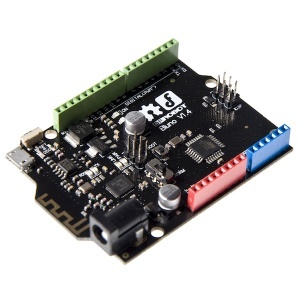 Bluno is also compatible with all Arduino UNO pins which means any project made with Uno can directly go wireless! Below are a number of resources on our website to support getting started with developing mobile apps using Evothings Studio. Enjoy discovering a new world of possibilities combining your Bluno projects and mobile applications!